Hero MotoCorp can be credited with creating the performance bike segment in India with the Karizma more than a decade ago. The Karizma has enjoyed a huge fan following and even though its facelift hasn’t really left a lasting impression on the buyers, one can still find many Karizma loyalists out there. Now, Hero seems to be readying itself to take the game to an all new level with the HX250R. The Hero HX250R launch could take place in the coming months, and the fully faired 250cc bike will soon become the most expensive model from the country’s largest selling manufacturer. It is being said that the Hero HX250R launch could take place in July and the new bike will rival the likes of Honda CBR250R, KTM RC200 and the ABS variant of the Bajaj Pulsar RS200. 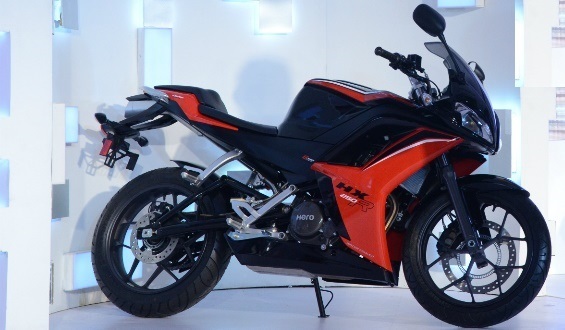 The new Hero HX250 is expected to be priced around INR 1.7 lacs, which means that the upcoming Hero bike might retail for around the same price as the Honda CBR250R. The upcoming motorcycle is powered by a newly developed 249cc single-cylinder, water cooled, fuel injected motor that is expected to have a maximum power of 31 bhp and a peak torque of 26 Nm. The engine will come mated to a six speed manual gearbox and will soon become the first engine from Hero to have no technological inputs from Honda. It is, however, expected to have an EBR link. Stay tuned to AutoColumn for more dope on the Hero HX250 launch date.